The executor is someone named to carry out the provisions contained within in a deceased individual's will. After the will is admitted to probate in the Surrogate's Court, the surrogate (the judge managing the case) authorizes the executor to begin his/her duties. 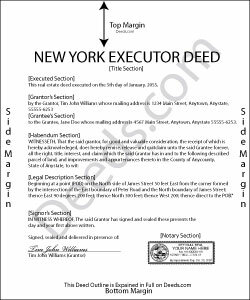 Frequently, these include using an executor's deed to sell the decedent's real estate. Executor's deeds contain the same information as warranty or quitclaim deeds, but they also include details about the executor and the deceased owner. The executor's signature must be notarized, but some cases may require a witness to sign the deed in front of the notary, too. Note that at sections 309-a and 309-b, New York's Real Property Law (RPP) sets out specific notary statements based on whether the deed is signed inside or outside the state. In addition to the standard state and local forms that accompany deeds submitted for recording, executors might also need to attach letters testamentary from the Surrogate's Court, certified copies of the decedent's death certificate and will, and other supporting documentation as appropriate. Probate procedures can be complicated, and each situation is unique. Seek assistance from an attorney or from the surrogate responsible for the case with any questions about this process. Robert B. said: Found this sight on the internet looking for information to add my fiance' to the house deed. Looks like the right place to be. Looking forward to getting the forms I need.